This Discounted Smart Thermostat Isn't a Nest. It's Better. 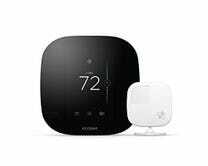 While it doesn’t have the brand recognition of Nest’s learning Thermostat, the Ecobee3 Smart Thermostat one-ups its most popular competitor by including a wireless remote sensor that you can place elsewhere in your house, giving the thermostat a more accurate picture of your home’s overall temperature. Plus, it’ll work with Siri via HomeKit, and your Amazon Echo too. For context, $200 is a solid $50 less than usual.